I’m officially starting to move into my apartment (!!!) at school. I’ve flip flopped on the design idea for this room all summer, but ultimately couldn’t stray away from my love for bright colors. I thought of doing different shades of blue and white with touches of gold, which would have looked just darling, but the accessories I already had from previous years were bright colors and I didn’t know if I could part with them. The deciding factors ultimately came when I found this pillow and this rug. 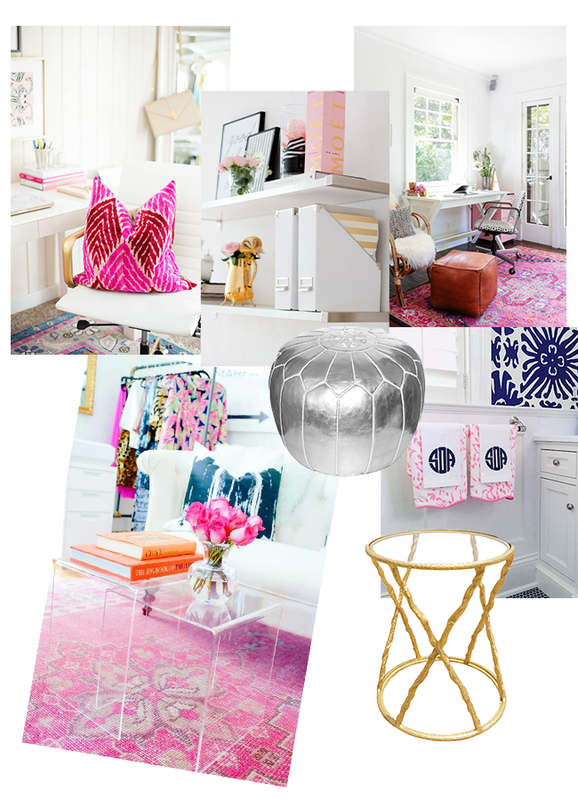 I’ve been seeing bright pink oriental looking rugs a lot lately and really love the look. My mom also found one of these silver moroccan ottomans at Homegoods and although I don’t think there will be any other touches of silver in the room, I like the contrast against my other gold accessories! (If you’re not a fan of most Moroccan ottoman price tags, check out Etsy! There are so many different colors and although these come unstuffed they’re much cheaper). I can’t wait to reveal what my room actually looks like in the next few weeks!